Erie Viaduct Fundraiser June 14 at LaBellas — Why Save the Viaduct? To Keep Kids Safe. 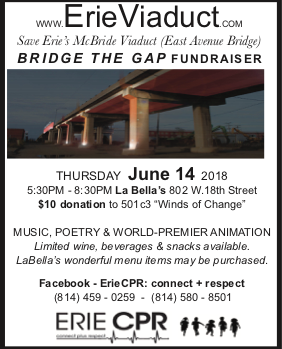 Stop by LaBella’s Restaurant, 802 West 18th Street, Erie PA on Thursday, June 14, 2018 from 5:30PM to 8:30PM to support ErieCPR's efforts to save the Erie Viaduct. Optional registration on Facebook. $10 (or more) donation requested to the ErieCPR fiscal sponsor, the 501c3, Winds of Change. Wine, soft drinks and appetizers will be provided, and, items from LaBella’s menu will be available for purchase. Musical guests include St. Stephen and Julie VonVolkenburg. In addition, Cee Williams and other poets will take the mike. The event will feature the world premier of Ron Blevins’ 1-minute animation based on drawings by Hey Beast illustrator, Jeff Brunner that Blevins set to music written and performed by Julie VonVolkenberg. In addition to the Erie Chapter of the NAACP, the African-American Concerned Clergy of Erie have joined ErieCPR’s call for a demolition delay and immediate Public Hearing.Contrary to misinformation issued from City Hall, there has never been a Public Hearing, the money is available to repair the bridge, and the maintenance cost would be obtained by a non-profit organization under a P3 agreement with the City similar to the one currently used for Frontier Park (L.E.A.F.). Adam Trott has noted that that the Viaduct’s damaged concrete and rebar aren't significant structural issues, but are rather similar to an “unsightly surface rash” that is easily repaired. His $1.35M proposal to stop the Viaduct’s deterioration includes: repairing the long-neglected and clogged storm drainage system; removing loose concrete and adding a protective seal to the scarred concrete; filling pot-holes on the deck and replacing joints between the decks.